A central location steps from three of the most coveted downtown residential neighborhoods: The West Village, SoHo, and Tribeca. Rezoning which has permitted the development of “affordable luxury” new construction. Highly significant space purchases by Disney and Google. Hudson Square is comprised of approximately 18 blocks bounded by West Houston Street to the North, Canal Street to the South, Varick Street to the East, and the Hudson River to the West. Pre-1970’s: The neighborhood primarily catered to printing companies attracted to the large concrete and steel factory buildings. 1970’s – 1980’s: Technology and design firms (driven by the area’s architecture, location, transportation options, and affordable rents) became major tenants. 2013 – Present (Rezoning/Residential Transition): While pre-2013 rules prohibited residential development, the new 2013 zoning permitted 3,300+ apartment units (with 20% of the units to be designated as affordable housing), 140,000 SF of retail space, 140,000 SF of office space, and 75,000 SF of community facilities. Funding was also put in place for open space, recreational amenities, and a new 450 student K-5 school. In December 2018 Google confirmed that it is investing ~$1.2 billion to create a new 1.7 million SF campus across three parcels in Hudson Square (315 Hudson, 345 Hudson, and 550 Washington) to accommodate ~7,000 new employees. Disney recently invested $650 million to purchase 4 Hudson Square, bringing it up to 1.2 million SF of neighborhood office space to house its New York operations. Finally, a key component of Hudson Square’s residential appeal is that it offers fully amenitized luxury new developments at an entry price-point (~$1.2 million for a one bedroom) and price/SF that is rare to find in prime Downtown Manhattan. Greenwich West (110 Charlton Street): prices ranging from a $1.45 million one bedroom to a $4.295 three bedroom. 570 Broome Street: prices ranging from a $1.275 million one bedroom to a $6.25 million three bedroom. 565 Broome Street: prices ranging from a $970K studio to a $40.5 million PH. 111 Varick Street: not yet listed. 100 Vandam Street: not yet listed. Please don’t hesitate to reach out to us with any questions, or on any of your real estate needs. The 421a tax exemption was created in the 1970’s to spur development in NYC at a time when new construction was stagnating. The program was further amended in the 1980’s to incentivize the creation of affordable housing. Broadly speaking, the program worked by temporarily reducing purchasers’ real estate taxes over a specific period, thus making the units more ‘saleable’ for the developer. The program provided a 3-year real estate tax exemption during construction for the sponsor followed by a 10, 15, 20, or 25-year abatement of individual unit taxes depending on the type of project and location. A Geographic Exclusion Area (‘GEA’) was designated which covered higher-priced locations including prime Manhattan, Northern Brooklyn, and the Queens waterfront. In order to qualify for 421a within the GEA developers were typically required to dedicate 20% of their constructed units towards affordable housing. Projects located south of 110th Street in Manhattan would receive a 20 year tax exemption for building affordable units on-site (as part of the subject condo project) and a 10 year exemption if they elected to build them in another location. In the rest of the GEA on-site affordable housing allowed for a 25-year exemption, while off-site provided 15 years. Generally the condo units’ post-construction real estate taxes would be almost zero until they bumped up to market levels by 20% increments over the last 5 years of the abatement. Leading up to (and following) the expiration of 421a in January of 2016, a heated debate ensued between city officials and private developers. Many city representatives argued that 421a did not provide sufficient affordable housing to justify the foregone tax revenues while developers contended that the cost of building in New York was so high (in part due to the price of land and construction) that an abatement was necessary to make affordable and market-rate development feasible. Not surprisingly, there was a drastic increase in developers filing for tax abatements as the 421a expiration approached, with 2015 seeing a record 54,619 units-worth of new condo and rental applications. Tellingly, between January and May of 2016, the city approved just 3,311 units, an 86% year-over-year decline. In April 2017 the current tax abatement plan, dubbed ‘Affordable New York’, was put in place. It notably excludes Manhattan condominiums and has a maximum assessed value/unit cap for qualifying projects. The project cannot be located in Manhattan or contain more than 35 units. The project must have an average assessed value not exceeding $65,000 per unit. Each purchaser must agree to maintain the unit as their primary residence for at least 5 years. Certain luxury condominium projects which: i) commenced construction between June and December 2015 and will be completed before December 31, 2019; or ii) commenced construction between January 2016 and June 2019 and will be completed by June of 2023 may still qualify to receive the previous 421a exemption. It is possible that the abatement will be renegotiated in the future — though that is unlikely in the near term. Buildings which still have several years of tax abatements (for example One Waterline Square, One West End Avenue, and 15 Hudson Yards) may benefit. Individuals may be more reticent to purchase in overly amenitized new developments with higher associated common charges given the lack of a tax exemption to reduce the monthly cost of home ownership. This may lead developers to focus more on more essential (e.g. doorman) vs. elective (pools and golf simulators) amenities. We may see a greater leveling of the playing field between resale and new development apartments. The luxury condo market pricing correction that we have already witnessed, combined with the lack of 421a, may reinforce more strategic and moderately-paced development in NYC and possibly put downward pressure on the price of land. Thank you for your referrals and feedback. Google is set to purchase Chelsea Market, the 1.2 million square foot office and retail property located at 75 Ninth Avenue for ~$2.4 billion from its current owner, Jamestown. This acquisition will add to Google’s existing fee-owned 2.9 million square foot New York headquarters located across the street at 111 Eighth Avenue, effectively creating a mega-campus for its employees in the Chelsea/Meatpacking neighborhood. The company’s impending $2.4 billion purchase price underscores its growing commitment to NYC, particularly when compared to Jamestown’s 2011 buyout of Chelsea market for an implied valuation of $800 million. Google’s expanding presence is emblematic of an overall increase in the number of technology firms choosing New York as a base of operations, and consequently, as a home for their employees. In fact, employment at tech firms in New York City has grown 3 times faster than other areas of the private sector, adding more than 50,000 jobs since 2010. While the modern technology sector began on the West Coast and was founded upon the development of technology and software, the industry is now moving towards the application of that technology across other sectors such as finance, healthcare, media, and retail. New York’s status as an international business capital has made it a natural and growing hub for this expansion. Google is not the only tech company expanding its presence. Facebook, Amazon, Salesforce, and Spotify are also enlarging their New York space by hundreds of thousands of square feet. J.P. Morgan is slated to build a new 2.5 million square foot 70-story headquarters for its 15,000 employees on the site of its current flagship at 270 Park Avenue. Demolition of the existing property is expected to begin in early 2019 with the new tower completed in the following 5 years. The new tower will be approximately 500 feet higher than the existing 52-story headquarters and add ~1 million additional square feet of office space. It will allow J.P. Morgan to both modernize its office space and accommodate all future growth plans. J.P. Morgan’s new headquarters was the first building to be approved under the new Midtown East Rezoning Plan. The Midtown East Rezoning Plan covers 39th Street to 57th Street from Third Avenue to Madison Avenue and is the result of developers’ and corporations’ desire to build taller, more efficient state-of-the-art office towers coupled with elected officials’ and community groups’ focus on improving the area’s transit system and streetscape. Under the final terms of the rezoning developers can purchase unused air rights from neighborhood landmark buildings (for example, Saint Patrick’s Cathedral) in order to build taller skyscrapers. In return, the city will collect a tax of $61.49 per square foot of air rights sold which will fund pedestrian plazas, sidewalks, transportation, and infrastructure improvements. J.P. Morgan’s purchase of neighboring air rights alone is expected to generate ~$40 million in associated City revenue. J.P. Morgan’s new tower represents not only a recommitment by one of the banking Industry’s largest employers, but also an effort to ensure that Midtown is able to exist as a preeminent office destination that can compete with newer developments such as Hudson Yards. In conclusion, it is worth pointing out that corporations’ ultimate goal is to attract the best talent, which in part means anchoring their firms in locations where that talent wants to live. With that in mind, we feel that New York continues to be viewed as one of the most attractive residential markets for a global set of buyers and investors. The final bill replaces the previous corporate taxation structure which had a maximum rate of 35% with a new flat rate of 21%. Corporations’ higher after-tax profitability could increase earnings for employees and executives while also benefiting certain high net worth individuals’ tax structures. This additional revenue could in turn be used towards real estate investments. Lower corporate taxes could decrease the value of Lower Income Housing Tax Credits (LIHTC) as an income offset and their associated funding for lower income housing construction. The final bill caps the deduction for state and local property and income taxes (SALT) at $10,000 for both individual and joint filers. This ceiling on the maximum state and local taxes which can be itemized and deducted most directly impacts high tax states like New York. Although Governor Cuomo has indicated that New York may consider partial restructuring of its state tax code to counteract the relatively punitive effect of the SALT deduction ceiling, no changes are currently in place and one certainly cannot rely on them occurring. The final bill increases the standard (i.e. non-itemized) deduction to $24,000 for joint filers and $12,000 for individual filers. A higher standard deduction would make some individuals less motivated to itemize their deductions and consequently reduce the value of mortgage interest and property tax deductions as home-ownership incentives. The final bill reduces the limit on deductible mortgage debt to $750,000 for new loans taken out after 12/14/17. The previous deductible mortgage debt limit of $1,000,000 will remain in effect for loans prior to that date. The final bill retains the current 1031 like-kind exchange rules and accompanying capital gains tax deferment for real property, while repealing it for personal property such as art work, etc. The final bill doubles the estate tax exemption to $11.2 million for individuals and $22.4 million for married couples. Thank you for your referrals and feedback! Many of our clients are questioning whether an oversupply of ‘aspirationally’ priced new development units has led to a market bound for further price reductions. While it’s worth noting that at the present pace it will take an estimated 3 years to sell out the currently listed and available-to-be-listed (‘shadow’) Manhattan new development inventory, resale (non-new development) inventory has actually remained consistent over the last quarter. In addition, although Brooklyn currently has an oversupply of rentals, the number of for-sale units in the borough has fallen 30% year-over-year. This has translated into greater demand than supply and an extremely brisk absorption rate of ~1.9 months. Some buyers are asking whether they can achieve lower pricing 12 months from now, while sellers are wondering if it’s an appropriate time to list. As daily participants in the market we are seeing that there has, in fact, been a great deal of correction which may not always be reflected in stated asking prices. In addition, we are seeing discounts on asking prices of ultra-luxury new development units up to ~15% in the most aggressive cases. We believe that today buyers can purchase the best quality assets (with most long-term appreciation potential) at opportunistically negotiated pricing before there is an overall consensus that the market has entirely corrected, and every participant waiting on the sidelines jumps in and ultimately bids up higher-quality homes. 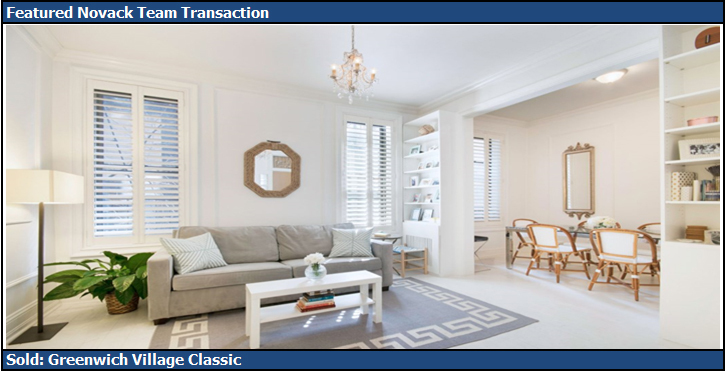 Sellers that list now are able to achieve the best execution before ‘must sell’ owners potentially trade at a very strong discount in their building/line and create a historical sale comparable that will set a value ceiling in the eyes of many purchasers. By way of example, we recently listed a $7 million+ asset and were under contract in under two months very close to ask because it was strategically priced, negotiated, and staged. Garnering best-in class online, print, and broker network exposure domestically and internationally were also key in terms of standing out from competing homes. We are always happy to discuss any particular questions you may have so don’t hesitate to reach out! Thank you for your continued referrals! One of the primary considerations for many of our clients when making a home purchase is ensuring the accessibility of excellent schools. School proximity is not only a factor for families with current or expected children, but also a driver of resale value for any homeowner. We therefore thought it would be informative to briefly outline some of the long-standing and new excellent schools in areas outside of the traditional Upper East and West Side locales. We are pleased to announce the launch of Sotheby’s International Realty Development Advisors. Sotheby’s unrivaled global referral network of 20,000 agents in 880 offices located across 70 countries. Our strategic relationship with the auction house and access to its affluent clientele around the world. The ability to accurately position inventory since we are entering the market when there has already been a reassessment about appropriate price levels and unit mixes. The full backing of a dedicated new development team with the resources and personnel to optimally support all facets of a project including pre-construction consulting, strategy, in-house and outside marketing, and (most importantly) sell out! The Lower East Side (‘LES’) is undergoing a renaissance with 9 new luxury condo projects currently on the market or soon to be listed. We are seeing a mix of both personal use and investment buyers. Unlike Hudson Yards or other mega-project areas, this is an established neighborhood with existing diverse and fantastic restaurants and retail that cannot be replicated by a developer irrespective of how much money they invest. Walking distance to some of the most coveted downtown locations (e.g. Soho, Nolita, Tribeca) where new condos are significantly more expensive on an overall and price per square foot basis. Since 2012 the LES’ average price per square foot has risen more slowly than other downtown locations, creating potential opportunities for future appreciation. Developers are mixing high-end finishes and large windows with more efficient floor plans that maximize the number of bedrooms relative to square feet. Limited plots of developable land in neighborhood. 150 Rivington: former site of Strait’s Matzo Factory which will include 45 condos ranging from a ~$995K 1-bedroom to a $3.9 million 3-bedroom. 196 Orchard: created from the sale of the air rights over neighborhood favorite Katz’s Deli. Includes two-story Equinox and 94 apartments ranging from a ~$1 million studio to a ~$4.2 million 3-bedroom. 215 Chrystie Street: Ultra-luxury new development launched in 2014 as a partnership between Herzog & de Meruon and Ian Schrager. Prices start at ~$4 million (with the majority of units over $7 million). All units are already under contract other than one. 242 Broome: one of the buildings slated for the Essex Crossing SPURA site with 55 apartments ranging from a ~$1.3 million 1-bedroom to a ~$5.25 million 2-bedroom. Another highly significant project is the ~1.65 million square foot Essex Crossing Redevelopment that is transforming the six-acre section of the LES commonly known as the Seward Park Urban Renewal Area (‘SPURA’) which had remained largely vacant since 1967. Upon fruition the project will include approximately 1,000 units of housing, retail, a park, offices, movie theater, and an indoor ‘Market Line’ housing the Essex Street Market and other vendors. Phased construction began in 2015 and is anticipated for completion in 2024. As individuals look forward in the wake of a uniquely charged election, one area of focus (among many) is the new administration’s effect on New York real estate. Wall Street: Wall Street has seen some increases following the election, particularly for construction companies such as Caterpillar. Bank shares have also done well with SPDR Financial Select Sector exchange-traded funds reaching their highest point since 2008. In addition, the proposed loosening of financial regulations could facilitate lending and provide a boost in the near term. Infrastructure: The proposed investment in infrastructure could have a positive effect on New Yorkers’ physical surroundings and the overall housing market if implemented properly. International Purchasers: New York is generally still considered a global safe haven for real estate investment. Notwithstanding, the tone of rhetoric and the administration’s foreign policy, immigration, and trade stances must certainly be closely watched. Taxes: The president-elect has generally proposed a lessening of income taxes (particularly for more affluent individuals), corporate taxes, and perhaps the inheritance tax – all of which should benefit the purchasing power of the luxury New York buyer base. Accordingly we may see an increase in real estate investment. We appreciate your continued referrals. I) NOVEMBER 8, 2016 PRESIDENTIAL ELECTION: While it is normal to experience some hesitancy in the months leading up to an election, the current presidential race has been particularly polarizing and attracted more international attention than any in history. WHAT DOES IT MEAN? We have seen a little slowdown in traffic as some individuals wish to see the results before making a major financial or investment decision. That said, decisive buyers are smartly capitalizing on great properties today, while sellers are in some instances actually benefiting by listing now before what will likely be an uptick in competing inventory when many chose to list in November. Interestingly, not all international groups are responding in the same manner. We are experiencing increased interest from certain nationalities while others are temporarily holding off. II) NEW DEVELOPMENT INVENTORY: There is a large pipeline of current and future new development inventory. WHAT DOES IT MEAN? Many developers are choosing to release product in smaller groups so that they do not flood the market. We are seeing a clear disparity in the great success of certain developments while others experience sluggish sales. Buyers are now more focused on new construction that provides a strong location, views, and usable square footage. Projects which offer these attributes are selling very quickly – often even without a model unit. Others which are very expensive but offer huge square footage relative to the number of bedrooms without intrinsically desirable neighborhoods or architecture simply aren’t moving. III) INTEREST RATES: It is likely that the Fed will begin a gradual increasing of interest rates by the end of the year. WHAT DOES IT MEAN? Interest rates are still at historical lows which is a strong driver for buyers who want to lock in a long term low cost of borrowing. This correspondingly benefits sellers who can take advantage of a motivated buyer pool. The anticipation and ultimate reality of gradual interest rate increases should create a greater sense of urgency among buyers as they realize that the unprecedentedly favorable lending environment will not last forever.